Mieczysław Weinberg has been on an upward curve for the last ten years. The already extensive discography will surely expand with the hundredth anniversary of Weinberg’s birth in 2019. We can hope that his music will be taken up more widely. Sterling work has already been done for Weinberg by David Pountney and the Bregenz festival where the Requiem and Sixth Symphony have been heard. Weinberg based his opera The Passenger on the radio play The Passenger in Cabin 45 by the Polish author Zofia Posmysz who later turned it into a novel titled Passenger. Posmysz was herself a survivor of the Auschwitz and Birkenau concentration camps. The plot concerns the chance meeting on an ocean liner bound for Brazil between Lisa a former SS guard at Auschwitz and Martha a prisoner at the concentration and extermination camp. It seems that Shostakovich read the novel in a Russian translation and recommended the work to his friend Weinberg with the suggestion that it could be made into an opera. Commissioned by the Bolshoi Theatre in Moscow, Weinberg completed The Passenger in 1968 to a libretto by Alexander Medvedev. Pountney wrote: “(the) Soviet authorities didn’t think a piece about Jews would further the interests of the communist state” so effectively the USSR washed its hands of the score. It actually reached rehearsal stage at the Bolshoi, Moscow but was never staged. Weinberg biographer David Fanning in the accompanying documentary states that this suppression by the Soviet authorities “was the greatest artistic disappointment in his life.” So Weinberg who died in 1996 never did see the opera performed and it lay virtually forgotten for nearly forty years. Green shoots of recovery occurred in 2006 when a concert performance of The Passenger was given in Moscow. Thankfully Pountney began investigating the music, discovered The Passenger and developed an interest in staging it. This project came to fruition in 2010. 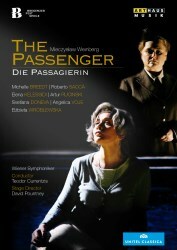 This Blu-ray of The Passenger was recorded live during the première run of Pountney’s staging at the Festspielhaus as part of the Bregenz Festival, Austria in 2010 a co-production with the Teatr Wielki, Warsaw, the English National Opera, London and the Teatro Real, Madrid. This Arthaus Musik release of The Passenger is a re-issue of the video recording originally issued on Neos in 2010. The opera begins in the 1960s with Lisa’s and her husband Walter, a diplomat, sailing to his new posting in Brazil. A former SS guard at Auschwitz Lisa repeatedly sees a veiled Polish woman who appears to be Martha a former camp inmate she believes died. Tormented she confesses her secret SS past to Walter. Intertwined in the story are flashbacks to Lisa’s time at Auschwitz centred on Martha and her fiancée Tadeusz. Some seventy years on, the Holocaust still shocks to the core and using the Holocaust as a theme for dramatisation is not without controversy. Pountney said “Of course, one can’t ignore that Auschwitz carries a unique weight and emotional impact.” Although on a much different scale to the Holocaust I think back to the grand operas of the early-to-mid nineteenth century which frequently depicted heinous acts such as burning heretics at the stake in Verdi’s Don Carlos, the massacre of the Protestants in Meyerbeer’s The Huguenots and in Halévy’s La Juive death by immersion into a cauldron of boiling oil. Certainly Pountney and his set designer Johan Engels could easily have made the horrors of the extermination camp considerably more graphic and upped the level of violence and brutality. One such example is the scene when Tadeusz is ordered to play waltz music on a violin for the Kommandant and defiantly plays some of the J.S. Bach Chaconne instead. Tadeusz’s subsequent beating by the SS guards here doesn’t look especially convincing and the depiction of violence might easily have been intensified. There is another scene that stops with a group of inmates shown walking towards the gas ovens rather than amplifying the depravity of the genocide. Getting the balance of how much explicit detail to display can’t have been easy as the judgement depends very much on one’s perspective of those terrible events. Upon reflection, although anticipating more graphic cruelty to be shown, Pountney’s production team have it about right. Engels has designed the stage on two distinct levels with connecting stairs. The top level depicts the luxurious top deck of the ocean liner all painted white with the passengers, band and crew in white formal wear. At ground level, providing a stark contrast, is the hellhole that is Auschwitz. We see railway lines with buffer stops for transporting prisoners to the camp, cramped sleeping quarters and the gas ovens. Inmates are dressed in dehumanising grey uniforms, ragged striped suits for men and smocks for women with a smaller number of jackbooted SS guards in their instantly recognizable uniforms. Michelle Breedt gives an expert portrayal of Lisa the diplomat’s wife a former camp guard who remains anguished about her past despite showing acts of kindness to the inmate Martha. Actually Breedt looks to be too pleasant a character to have been chosen as an Auschwitz guard in the first place unlike Heide Capovilla portraying a ferocious looking senior overseer. Despite looking a touch nervous the South African born mezzo-soprano is firmly focused revealing a slightly dark hue to her timbre that feels ideal. Tenor Roberto Saccà impresses in his role of the suave Walter clearly relishing the prospect of his diplomatic mission. The German’s bright tenor projects strongly with excellent diction yet ideally I wanted him to display a little more distress and anger when discovering Martha’s former life as an SS guard. Giving a formidable performance is Elena Kelessidi as Martha the stoical young Polish prisoner. Her experiences at Auschwitz have not completely destroyed Martha’s spirit which shines through like a beacon, acting as a source of comfort to some of her fellow inmates. After two years apart Martha’s chance meeting with her fiancée Tadeusz feels improbable but works nonetheless. It's remarkable how the Kazakhstan-born Kelessidi is able to sustain her radiant warmth and appealing tone throughout. Etched on my memory is the Epilogue with Martha now dressed in a teal coloured twinset and beige skirt as she sits on the ground and looks up reflectively. She beautifully delivers the final aria of the opera Wie ruhig ringsumher (How silent and how still!) with an affecting restraint that develops into a stirring emotional response; so well acted too. Polish inmate Tadeusz a violinist is reliably played by Artur Ruciński, a steady-toned Polish baritone. Despite not seeming entirely comfortable in the role Ruciński effectively communicates his emotional distress at being parted from Martha. Israeli soprano Talia Or as the young inmate Ivette sings smoothly with notable expression and I would like to hear her in a larger part. Norwegian Angelica Voje as Krzystina is an attractive mezzo-soprano and I recall her singing movingly of her lost faith. I enjoyed Russian mezzo-soprano Liuba Sokolova, a wonderful actress in the role of Bronka, who expressively prays for God’s help for the children’s safely. The valuable contribution from the Prague Philharmonic Choir demonstrates its undoubtedly immaculate preparation by chorus master Lukáš Vasilek. It is hard to fault the unerring support from the Vienna Symphony Orchestra under Teodor Currentzis, a partnership which relishes the character and challenges of Weinberg’s unfamiliar score. Filmed in High Definition the picture quality is excellent. Video direction by Felix Breisach is generally satisfactory although he does tend to take every opportunity for close-ups. A drawback of the vivid high-definition picture are the close-ups which clearly show the creasing in the latex of the shaved head wigs worn by the inmates. Recorded in live performance the sound options LPCM Stereo and DTS-HD Master Audio provide stunning sonics with plenty of detail from both pit and stage. Noticeable is the grinding revolving mechanism and some other occasional extraneous stage noise; nothing to worry about though. This Arthaus Musik release contains ‘bonus material’ namely a documentary and some trailers for four other releases on the label. Lasting around half an hour the documentary film In der Fremde (In Foreign Lands) in German with English subtitles is interesting and informative. Focusing on Weinberg’s life and the making of The Passenger there are insightful contributions from David Pountney, Zofia Posmysz, Teodor Currentzis and David Fanning and one or two others. The accompanying booklet in the blue plastic case contains full cast and production lists. There is a list of acts and scenes but they are not indexed, this content is contained rather basically on the disc itself. In the booklet there are two articles: the first About the Opera is credited to Dmitri Shostakovich, Moscow, September 1974 and the second a short piece titled The Passenger containing a six line synopsis is unaccredited given in a translation by Steven James White. Crushingly powerful and deeply affecting, Weinberg’s The Passenger is presented strongly and is captured marvellously here on Blu-ray.